One consideration of this essay is that it is best if the reader has some familiarity of the music of Suzanne Vega and has read McCullers’ novel. Understanding that those conditions are not always met, I’ve tried to write this piece in a way that could hold the interest of people unfamiliar with either artist. A side benefit is that it might nudge someone to pick-up the novel and to explore Vega’s music. 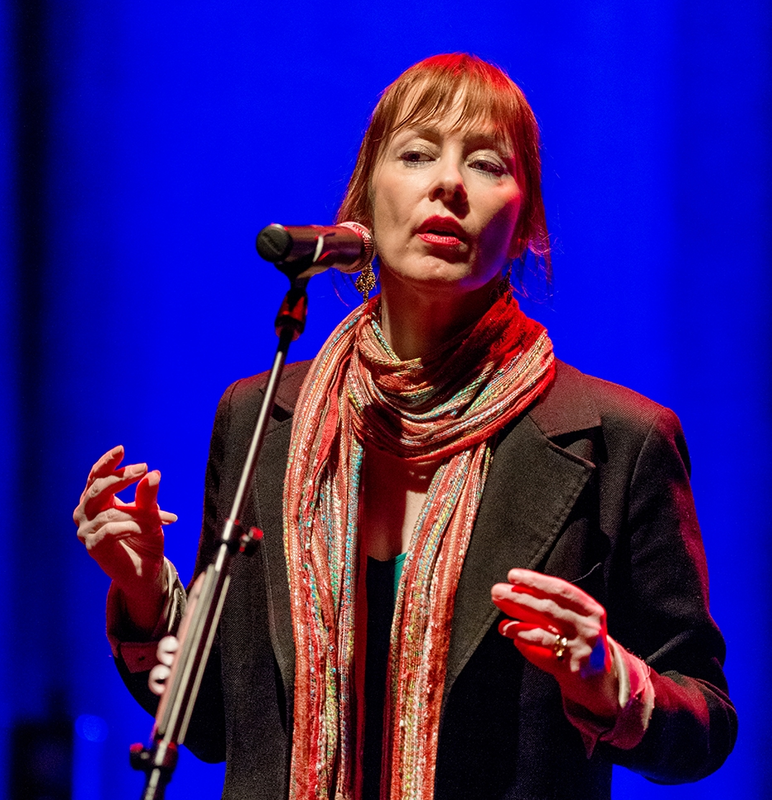 A second consideration is that the associations between Carson McCullers’ novel and Suzanne Vega’s music are subjective to my personal experience with the material; it is therefore not an “analysis” of the works but merely one person’s impressions. Decades and geography separate the lives and work of these two artists; McCullers published The Heart is a Lonely Hunter in 1940 and died in 1967. Vega has publicly spoken of her admiration for McCullers’ work but I do not make the claim that her work was directly inspired by McCullers. Perhaps some of it was; perhaps some is coincidence. 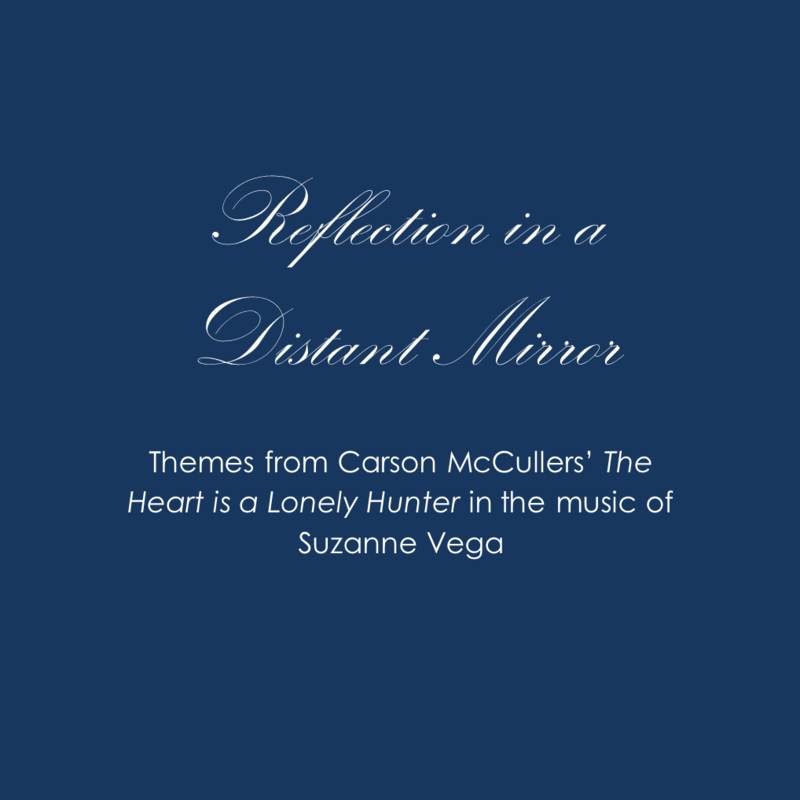 Rather, this essay is about how for this reader and listener, the act of reading McCullers conjures up the music of Suzanne Vega and how, when listening to Vega’s music, a distant reflection of McCullers’ images and characters often materializes. Biff sensed that someone was standing in the entrance and he raised his eyes quickly. A gangling, towheaded youngster, a girl of about twelve, stood looking in the doorway. She was dressed in khaki shorts, a blue shirt, and tennis shoes – so that at first glance she was like a very young boy. Biff pushed aside the paper when he saw her, and smiled when she came up to him. An important association of Suzanne’s music with this novel is captured in this paragraph. 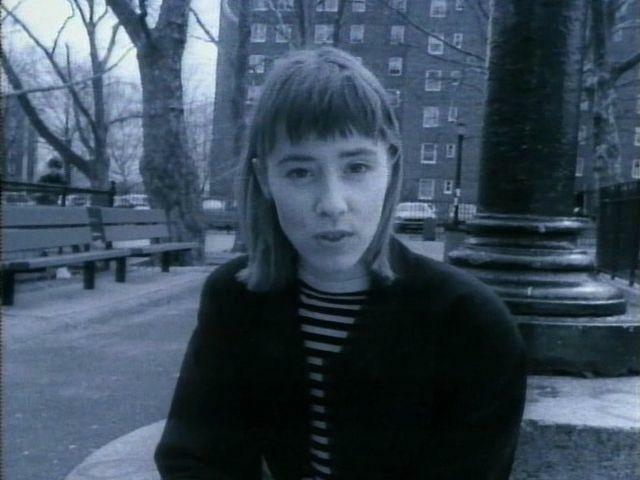 Although we are in the southern U.S. just before WW II, into the aptly named “New York Café” (faint echo of Vega’s hometown; faint foreshadow of “Tom’s Diner”) walks Suzanne Vega/Mick Kelly. Of course, because Mick is entirely a phantom in our imaginations as conjured-up by McCullers there is no way to make a case for the similarity of Vega at twelve to Mick Kelly, but nevertheless it is Suzanne that enters my version of McCullers’ New York Café. 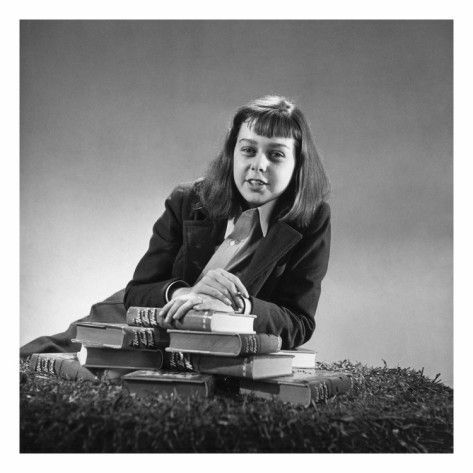 It is startling to see photos of McCullers as a young woman – they are eerily like those of Suzanne –geometries of straight hair and bangs; their pale-skinned angularity. Whether or not Mick is modeled on McCullers I cannot say but in my imagination it is Carson/Mick/Suzanne who we follow through the novel. Finally she went back in the kitchen and took Ralph out of his highchair and put a clean dress on him and wiped off his face. Then when Bubber got home from Sunday School she was ready to take the kids out. She let Bubber ride in the wagon with Ralph because he was barefooted and the hot sidewalk burned his feet. She pulled the wagon for about eight blocks until they came to the big, new house that was being built. The ladder was still propped against the edge of the roof, and she screwed up nerve and began to climb. This was her, Mick Kelly, walking in the daytime and by herself at night. In the hot sun and in the dark with all the plans and feelings. This music was her – the real plain her. And I know even that’s not gonna last me long. live out on the land. One can picture Mick amusing herself or Bubber and Ralph with a stick on the sidewalk outside their home. They are all very busy people. In fact they are so busy that it will be hard for you to picture them. I do not mean that they work at their jobs all day and night but that they have much business in their minds always that does not let them rest. They come up to my room and talk to me until I do not understand how a person can open and shut his or her mouth so much without being weary. Who would he be loving now? No one person. Anybody decent who came in and out of the street to sit for an hour and have a drink. But no one person. He had known his loves and they were over. 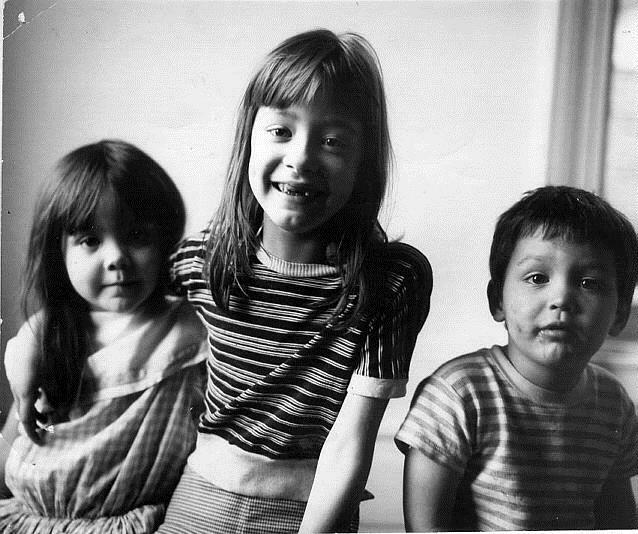 Alice, Madeline, and Gyp. Finished. Leaving him either better or worse. Which? However you looked at it. A doctor sits “in his dark kitchen alone” reading a book by a round-bellied wood stove in solitude for hours. After the solitary hours spent sitting in the dark kitchen it happened that he began swaying slowly from side to side and from his throat came a sound like a kind of singing moan. McCullers’ characters do not communicate with each other in any meaningful, open manner; they speak past each other, reserving their true thoughts to themselves and to us, who as readers are granted privileged access to their inner lives. This was the Antonapoulos who was always in his thoughts. This was the friend to whom he wanted to tell things that had come about. For something had happened in this year. He had been left alone in an alien land. Alone. He had opened his eyes and around him there was much he could not understand. He was bewildered. A good deal of the time they just roamed around the streets – with her pulling Ralph’s wagon and Bubber following along behind. Always she was busy with thoughts and plans. Sometimes she would look up suddenly and they would be way off in some part of town she didn’t even recognize. Often he went out for the long walks that had occupied him during the months when Antonapoulos was first gone. These walks extended for miles in every direction and covered the whole of the town. There was no part of town that Singer did not know. He watched the yellow squares of light reflect from a thousand windows. The winter nights were beautiful. The sky was a cold azure and the stars were very bright. Solitude (even when among a crowd) is ever-present in Vega’s music. One hears it in “Cracking,” “Tom’s Diner,” “Rosemary,” “Solitude Standing,” and many other songs. Solitude and alienation envelops each of McCullers’ characters as the novel moves to its denouement. Mick Kelly has taken a job at the Woolworth’s for ten dollars a week, to help her family make ends meet. It is slow death for her and she knows it. She was going to work in a ten-cent store and she did not want to work there. It was like she had been trapped into something. The job wouldn’t be just for the summer – but for a long time, as long as she could see ahead. Once they were used to the money coming in it would be impossible to do without again. That was the way things were. would bring out her private box from under the bed and sit on the floor to work. In the big box there were pictures she had painted at the government free art class. She had taken them out of Bill’s room. Also in the box she kept three mystery novels her Dad had given her, a compact, a box of watch parts, a rhinestone necklace, a hammer, and some notebooks. One notebook was marked on the top with red crayon – PRIVATE. KEEP OUT. PRIVATE – and tied with a string. She had worked on music in this notebook all the winter. She quit studying school lessons at night so she could have more time to spend on music. Mostly she had written just little tunes – songs without any words and without even any bass notes to them. They were very short. But even if the tunes were only half a page long she gave then names and drew here initials underneath them. But now no music was in her mind. That was the funny thing. It was like she was shut out from the inside room. Sometimes a quick little tune would come and go – but she never went into the inside room with music like she used to do. Mick Kelly disappears from our view; the novel comes to an end. My fear has been that Mick did not pursue her music – she remained trapped, her dreams ground away. But I think there’s another ending to Mick’s story. Just before Christmas 2015 Suzanne played a show, in New York City, for a neighborhood charity. The show was in Harlem where she grew up. She sang a song titled “New York City is My Destination.” It is a song written to tell the story of Carson McCullers. As Suzanne/Mick sang the song I could imagine that Mick Kelly had achieved her dreams in music, that she was standing “up on the platform in front of the big crowds of people” as “a great world-famous composer” in New York. This is how I prefer to imagine what became of Mick Kelly. The quotes from The Heart is a Lonely Hunter are from the Mariner Books edition, 2000. “First Day Out” is found in the book The Passionate Eye by Suzanne Vega, Avon Books 1999. This book in general is a good example of the parallels between the work of Vega and McCullers.